This diagram identifies inwards connections to nodes and looking at the most prevalent nodes: ‘Zizikodwa’ and ‘helenzille’ stand and. 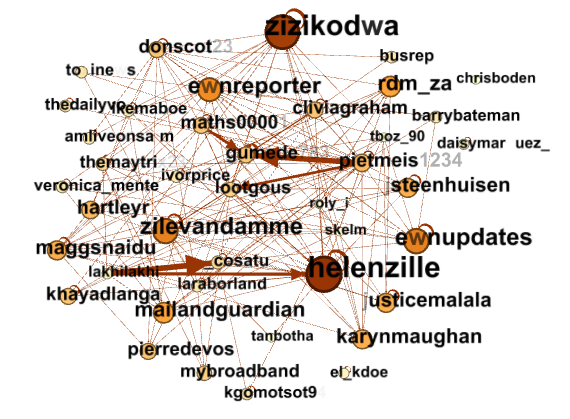 This means these users are mentioned, hash-tagged and retweeted the most in the network which suggests these key nodes or users have a high impact on their connections and the Twittersphere of South African local elections. Users may find tweets, facts or opinions of these users important, relevant or they may agree or disagree with the conveyed messaged and therefore convey the message of this influential user. The next level down from these two key influencers we have ‘ewnupdates’, ‘ewnreporter’, ‘zilevandamme’ (Phumzile Van Damme - national spokesperson for the DA), ‘rdm_za’ (Rand Daily Mail). Followed by: justicemalala (Justice Malala ‘Political commentator, media entrepreneur’), karynmaughan (official account of Karyn Maughan – legal journalist at @eNCA) ,jsteenhiusen (John Steenhiusen – ‘member of parliament and chief whip of the Democratic Alliance), maggsnaidu (Maggs Naidu – ANC member), hartleyr (Ray Hartley – Works at Times Media). These are mainly large, well known personalities in the South African geography and therefore having these users stand out as influencers on the Twittersphere correlates with our findings. An alternative approach is to look at the outward connections of the users which represents the interaction with other users an account has. The larger the node, the more this node spoke to other users. This alternate view shows influential users engagement levels with the community and how interactive and hands on they are. 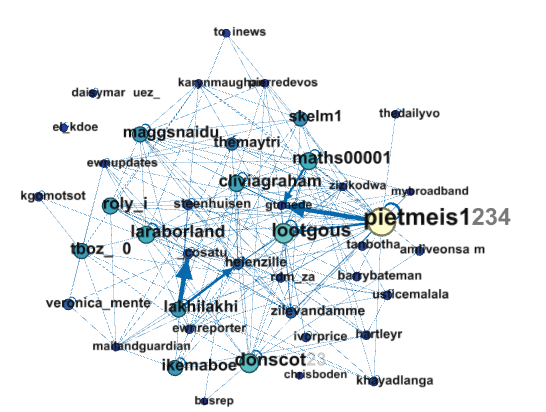 Pietmeis1234 stands out as the most engaging user in this network and creates a strong connection to gumede783 and lootgous as does lakhilakhi5 (Rachel – individual who loves politics) references _cosatu (COSATU TODAY – Africa’s largest Federation Official tweets) and helenzille (Hellen Zille). Gumede783 is referenced by maths00001 (Apostle Mahlahngu – Solomon Mahlangu though not officially) as well and less by cliviagraham (Graham Robert Evans – nothing revealed about identity on profile). So we therefore able to identify conversation starters on Twitter and who they start the conversation about. Both the influential users and engaging users can be seen as user who control the flow of information within the Twittersphere on the South African local elections.